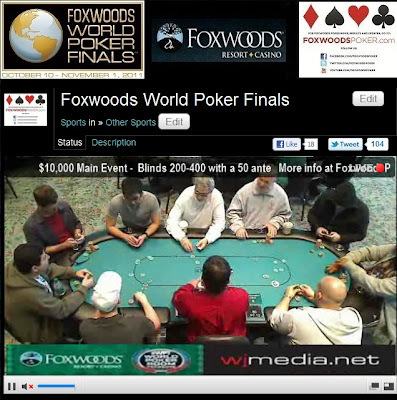 Play has come to an end on Day 2 of the $10,000 Foxwoods World Poker Open Main Event. There are 66 players remaining and Day 3 will resume at noon tomorrow. 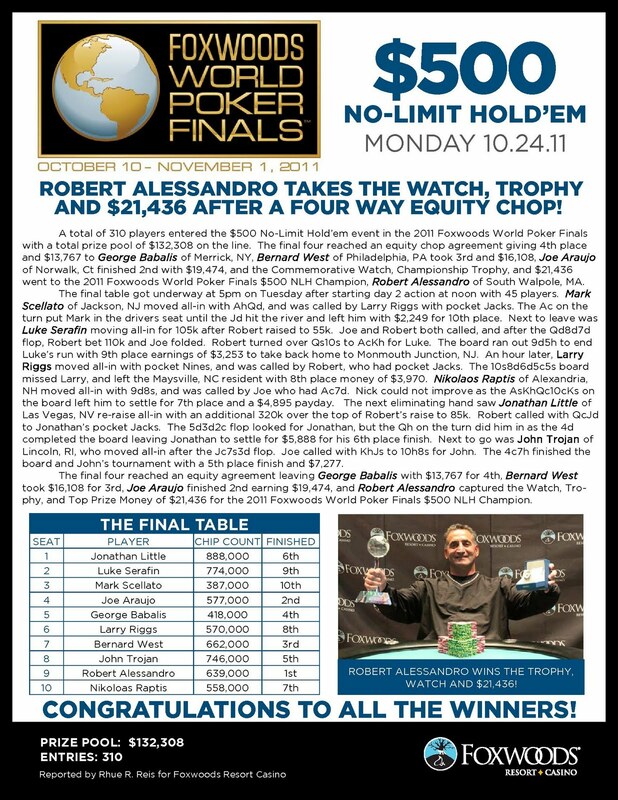 The final end of Day 2 chip counts and Day 3 seat assignments will be posted shortly on FoxwoodsPoker.com. The tournament clock is being stopped with 15 minutes remaining in the level and players will play six more hands today. There are currently 68 players remaining and the average chip stack is 83,300. With 81 players remaining, the average chip stack is now 70,000. When play resumes, the blinds will be increased to 500-1,000 with a 500 ante. Rob Brown, winner of the $500 Bounty event here at the World Poker Finals, has been eliminated from the Main Event when his pocket fives could not hold up against his opponent's A-Q when an ace hit the flop. Players have returned from break and the blinds have been increased to 400-800 with a 100 ante. With 97 players remaining, the average chip stack is now 58,400. Darren Elias just took a huge pot off of Christian Harder when Elias flopped a set of tens and got all-in against Harder's pocket aces. Elias is up to almost 200,000 while Harder is knocked down to about 50,000. David Williams has been eliminated from the World Poker Finals Main Event. We had a total of 189 players in the $10,000 Championship event at the Foxwoods World Poker Finals. When play resumes, the blinds will be increased to 300-600 with a 75 ante. There are now 116 players remaining in the field. With Level 7 about to come to an end, Christian Harder looks to be the chip leader with around 120 players remaining. Harder is nearing 150,000 in chips (nearly 300 big blinds). The 130 remaining players have returned from break and the blinds have been increased to 250-500 with a 50 ante. There are currently 189 players registered for the Main Event. Just click "Watch LIVE Feature Table" at the top of the page to view the live stream. Cliff "JohnnyBax" Josephy came into Day 2 with only 5,525 in chips and unfortunately was eliminated early in today's action. WPF Day 2 Now Underway! Cards are in the air on Day 2 of the World Poker Finals Main Event. 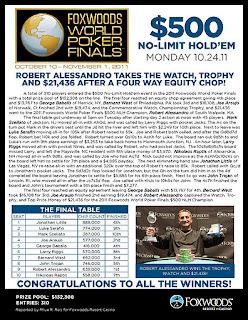 Click "Watch LIVE Feature Table" at the top of the page to view the live stream. The blinds are now 200-400 with a 50 ante. Play is about to begin on Day 2 of the Foxwoods World Poker Finals $10,000 Main Event. There are 141 players returning on Day 2 with Tom Schreiber leading the field with 104,000. Registration is still open for the Main Event. There are a few players who have called and are en route so registration will remain open through at least the first level to accommodate those arriving late.